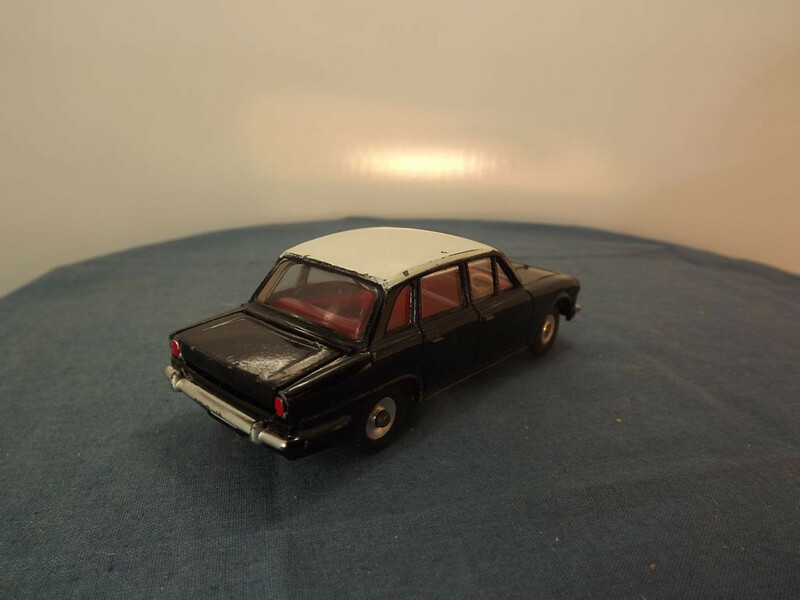 This model is the Dinky 135-G-x Triumph 2000 Saloon in a special colour scheme of black and white. 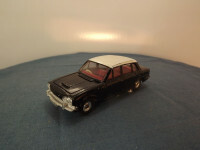 This is a Code 1 item with the casting having been completely assembled, painted and packaged in the factory, possibly as a special order for Triumph with whom Meccano had a special relationship and for whom it is reputed they produced several runs of standard models in special authentic Triumph colours. It is considered a Very Rare item. This model features a multiple piece cast body. The body casting has no opening features except for the bonnet and boot, both of which are separate castings. At the front is the mask sprayed bumper, headlights and grille in silver below which sits the front number plate. The bonnet opens to reveal a silver painted engine. The sides have cast door shapes, with handles, and a petrol cap cover. at the rear left. At the rear is a mask sprayed silver bumper, two red tail lights with silver highlighting, and the opening boot, with cast number plate, which probably held a brown plastic luggage case. The roof is white. 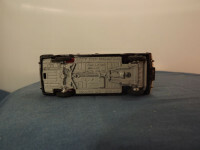 The interior consists of a red plastic molding featuring dashboard and front and rear seats, a white plastic steering wheel and a coloured paper label that shows the dashboard instruments. The glazing is clear all round. 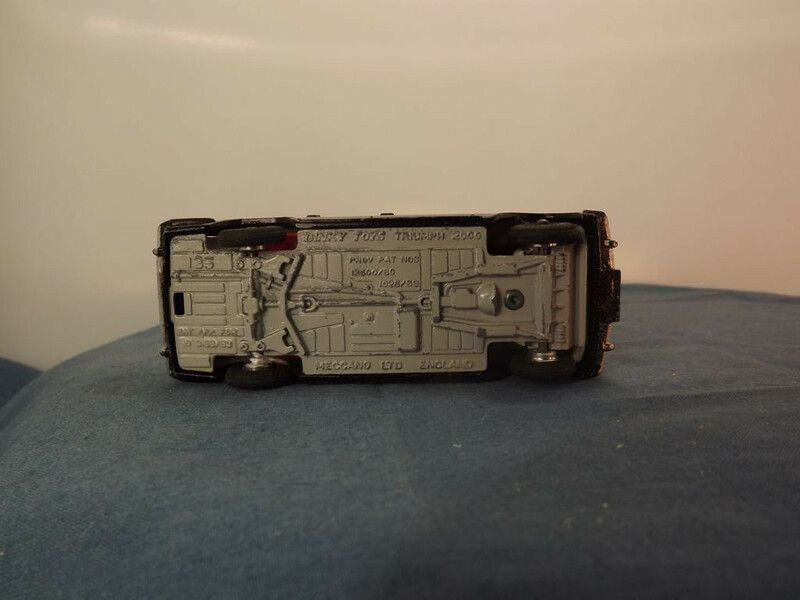 The baseplate is grey painted metal and is marked with "Dinky Toys,Triumph 2000 " at the top centre, "Prov Pat Nos, 12500/60, 1026/59" on a raised block in the middle centre above the driveshaft, "Meccano Ltd England" at the bottom centre, and "135" to the rear top behind the right wheel and "Pat App For, 3189/63" on two lines behind the left rear wheel. It also carries a complex casting depicting the front and rear suspension, differential, driveshaft, gearbox and exhaust system. All wheels have black rubber types with spun hubs mounted on steel axles. This casting was used between 1963 and 1969. None of my references indicate when this particular version of the model was issued, except "The Great Book of Dinky Toys" by Mike Richardson which indicated these special runs were done in 1963 only.